Don’t miss the Piemonte Culinary Celebration for a Taste of Italy Event like no other at Four Seasons Resort Orlando, October 27 – 29! When Four Seasons Resort Orlando at Walt Disney World Resort put out a call for all Italian food lovers to join them at the 3-day Taste of Italy Celebration of Piemonte this weekend, they might as well have written my name in big bold letters at the top of the press release. I am an Italian food lover and I do believe marinara sauce runs through my veins. A culinary excursion of Italy is at the top of my ‘someday list’. Wouldn’t you like to experience ‘La Dolce Vita’? Fantastic Italian chefs cooking all sorts of delicious dishes using the freshest of ingredients, Italian wines flowing, a beautiful outdoor setting overlooking majestic grounds, and animated conversation where everyone talks with their hands and kisses you on both cheeks to say hello and goodbye? I know I do. Fresh made pasta…. Yes, please! 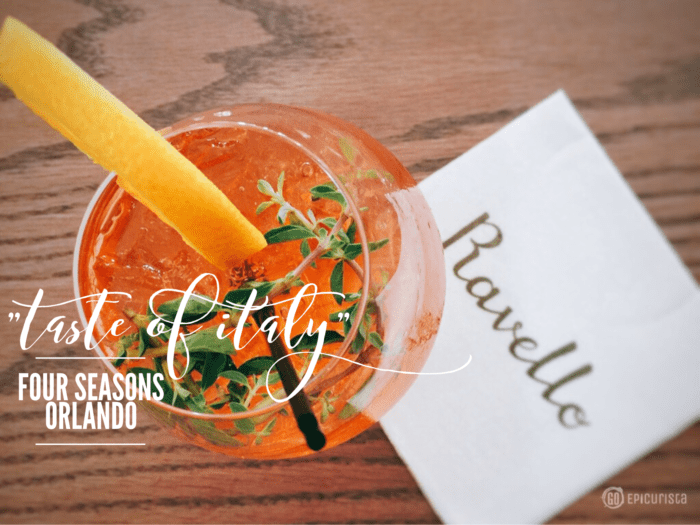 Until I can #MakeSomedayHappen with a trip to Piemonte, I’m lucky to have the Four Seasons Resort Orlando nearby. Executive Chef Fabrizio Schenardi, who hails from Torino, Italy is brining this authentic Italian experience directly to us at Ravello Italian Restaurant. Ravello will be host to several events highlighting the Piemonte region of Italy, which the Italian American Heritage Foundation has declared the “Region of Honor” for 2016. 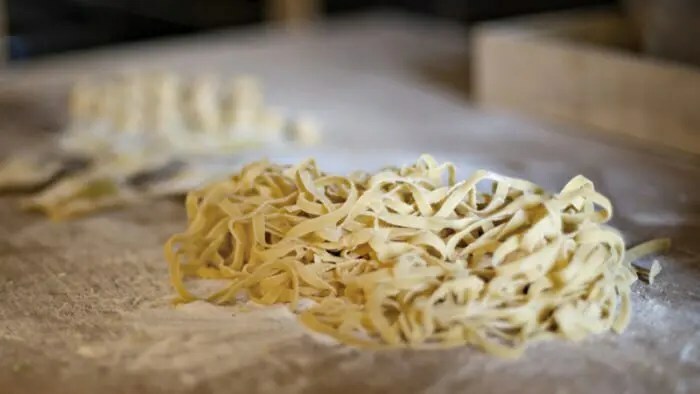 The events designed for Italian food lovers, some of which are complimentary, will allow guests to immerse themselves in an authentic ‘Taste of Italy’ experience. Ravello’s comfortable setting and open kitchen is the perfect backdrop. Schenardi has invited Italian guest chefs in partnership from the Italian Food Style Education (IFSE) Culinary School in Italy to prepare an Italian culinary extravaganza like no other. IFSE is the only cooking school that is acknowledged by the General Secretary of The Italian Republic, referred to as the most innovative school of Italian cuisine. In April 2015, Chef Schenardi was presented with the Paolo Bertani Award for his Italian culinary achievements by the Italian Academy of Cuisine and IFSE. During a trip to Italy this summer, Chef Schenardi was able to discuss collaborating with IFSE and Raffaele Trovato, the school’s director. 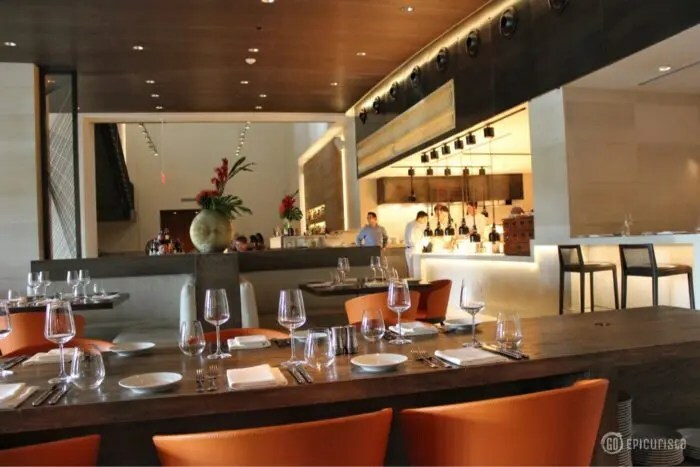 The three-day event will include Trovoto and other IFSE members, and will begin with a welcome tasting of imported Italian extra virgin olive oils with housemade breads, a decadent appetiser buffet, and wine tasting. Day two consists of a five-course Italian feast in Ravello and a dessert party in Capa; and a pop-up Italian Market will be offered Thursday through Sunday, to feature imported olive oils, wines, and housemade Italian pastries and desserts, from Chef Fabrizio’s bomboloni and biscotti to his housemade limocello and gelato. Visitors to the Italian Market can purchase these delicacies to-go, or can purchase and enjoy on property. A special Italian coffee lounge will feature delicious lattes, cappuccinos and more, to be enjoyed on the gorgeous outdoor terrace. Complimentary classes will also be offered to Resort guests and to the public. Taste unique wines from Piedmont, Italy, and enjoy a delicious buffet of Italian appetisers and an assortment of imported olive oils with fresh baked breads. Experience a decadent Italian feast that will transport attendees to feel as if they’re in Piemonte, Italy for the night. Featuring housemade pastas, gourmet breads and olive oils, and the exclusive white Alba truffle from Italy, this dinner will be a memorable experience. In Italy, throughout the month of October, the White Truffle Festival is one of the oldest Italian truffle festivals that remains widely attended year after year. Following the dinner, guests will delight in a Dessert Party held in a private dining room at the Resort’s rooftop restaurant, Capa. Stop by the Ravello Demonstration Kitchen, transformed into Il Mercato Italiano. The marketplace will feature imported olive oils, wines, and more for sale, in addition to housemade Italian pastries and desserts, from Chef Fabrizio’s bomboloni and biscotti to his housemade limoncello and gelato. Visitors to the Italian Market can purchase these delicacies to-go, or can purchase and dine on property. An Italian coffee lounge will feature delicious lattes, cappuccinos and more, and Giuso ice cream will be available as well, perfect to enjoy on the gorgeous outdoor terrace. This is a non-ticketed event guests can come in at leisure each night to shop and enjoy. 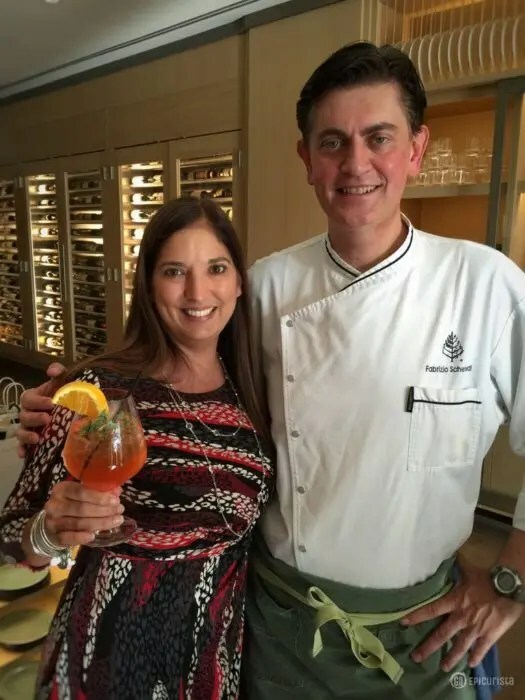 Enjoying a Ravello Spritzer with Chef Fabrizio Schenardi at Four Seasons Orlando. Join us! 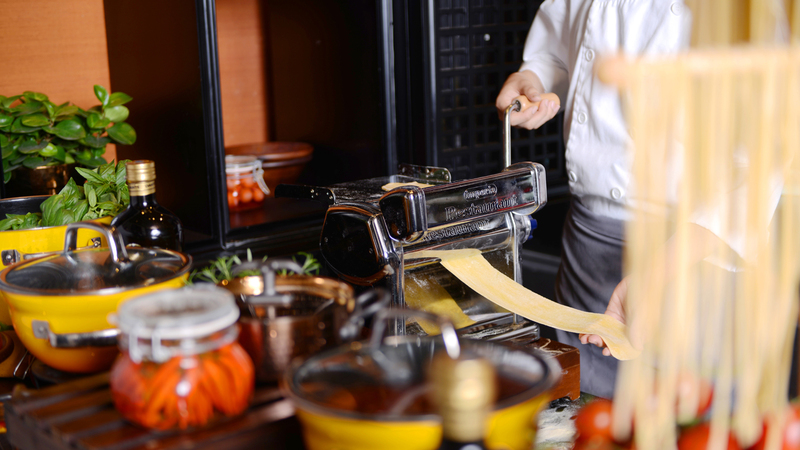 Are you ready to experience a Taste of Italy at Four Seasons Orlando? Is Italy on your ‘someday list”? Join me and Make Someday Happen!